It’s that time of year again folks!! Peeps are here!! 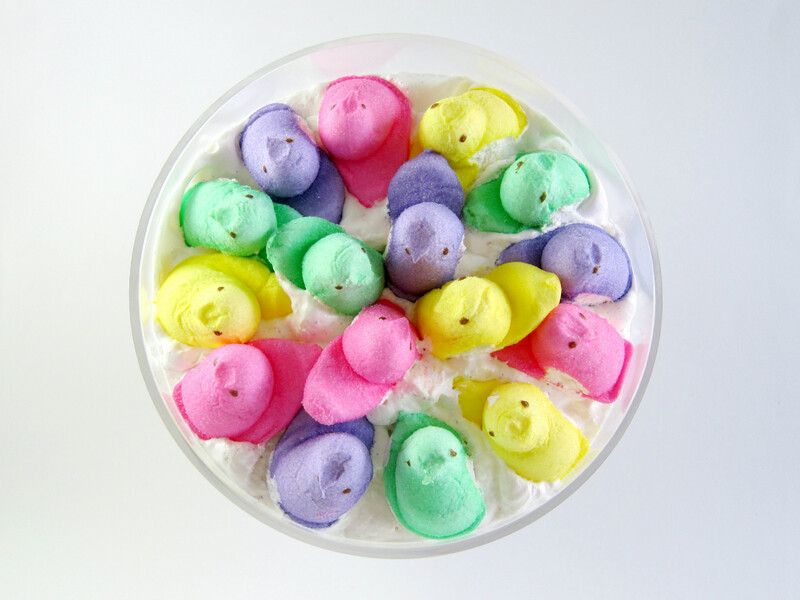 Technically, Peeps are becoming a bit of a year round thing. 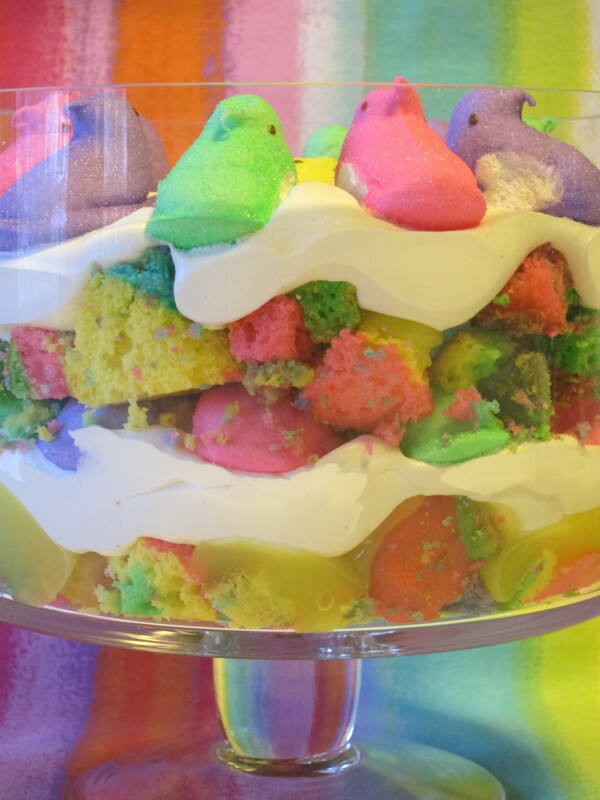 They have Halloween Peeps, Christmas Peeps, Valentine’s Peeps, star shaped Peeps for 4th of July….but the best Peeps are the iconic Easter Peeps in bright, happy Spring colors. Even if you don’t like to eat them, you have to admit they’re pretty damn cute! Last year I told you about some of my favorite PEEPS related activities and tried my hand at making PEEPS Bunny cookies. (Is the word “Peeps” starting to look funny to you too?) 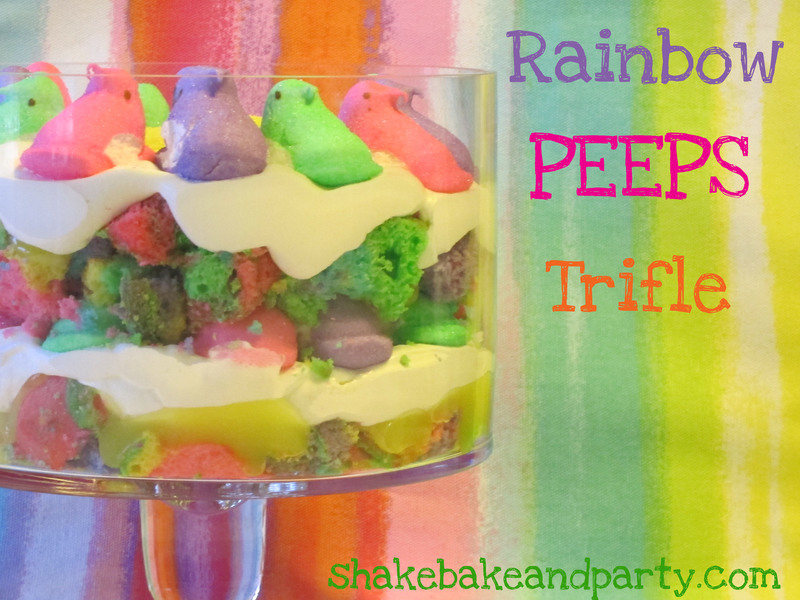 This year, I bring you the Rainbow Peeps Trifle! This oh-so-colorful and perfect addition to your Easter festivities was born from a failed attempt at making rainbow Easter egg cupcakes. A friend at work gave me the Wilton Easter Egg Cupcake Pan. I decided that I was going to make swirly multi-colored eggs with said cupcake pan. I whipped up some white boxed cake mix, separated it into five different bowls, colored the batter in each bowl with my gel colors and then plopped some of each color batter into the egg cavities. I swirled the colors together with the handle of a wooden spoon and stuck them in the oven. Then I watched them grow, and grow, and GROW (kind of like a Peep in the microwave)! Turns out I put waaaaaaaaaaaaaay too much batter into each egg. When they were finally done baking I had eight swirly-rainbow conjoined blobs. The colors were exactly what I had been hoping for, the shape…not so much. So, I ate one just for the hell of it and stuck the rest in a Ziploc bag. I wasn’t sure what to do with the rest of the “eggs” besides eating one for breakfast every day. I briefly entertained the idea of making cake pops but I made a gooey mess last time I tried those and I just don’t have the time for the rolling and dipping and drying and dipping again right now, so that was out. 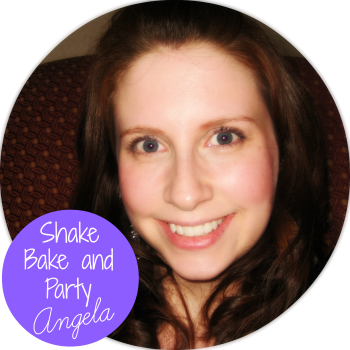 Then it hit me – I’d crumble up the cake and make a trifle! 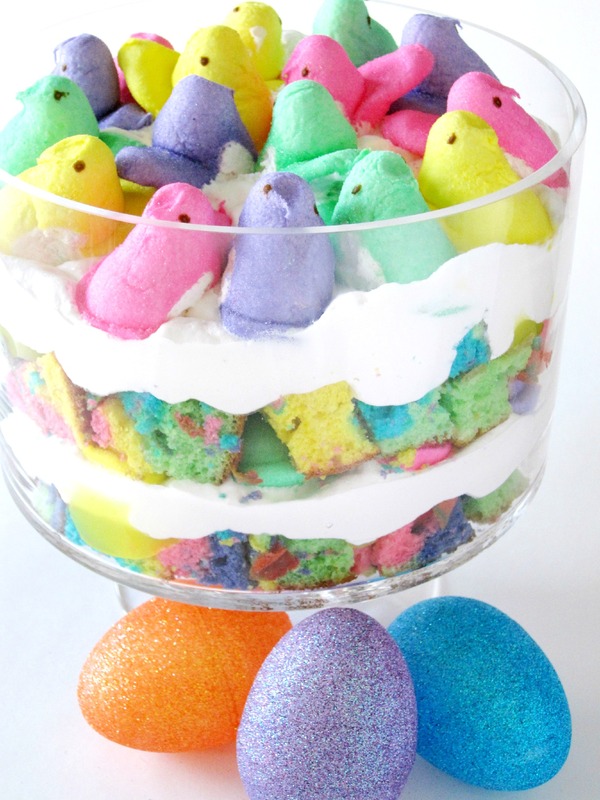 And what better to put in a rainbow cake trifle at Eastertime than some brightly colored Peeps?! !. Prepare cake mix according to directions on box. 3. Spoon blobs of the batter in a random color pattern into whatever cake pan you are using and give them a little swirl to mix up the colors. Don’t swirl too much or you will end up with an unattractive mess. 4. Bake according to the directions on the box for the type of pan you are using. 5. Let cake cool completely, then cut into bite-sized cubes. 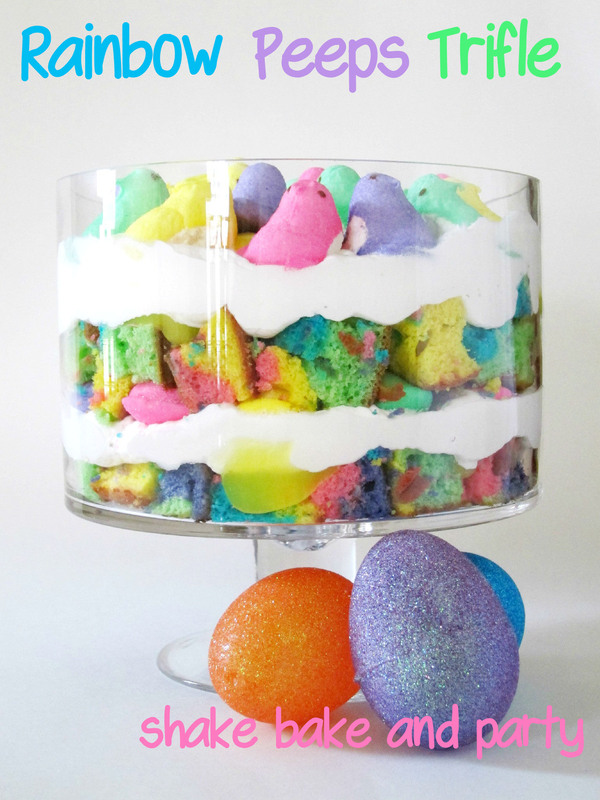 In a clear bowl (because a Rainbow Peeps Trifle is no fun if you can’t see all the layers) make a layer of the cake cubes. On top of that, spoon a layer of the lemon pie filling followed by a layer of Cool Whip. I used a piping bag to make the Cool Whip layer rather than trying to smear it around with a spatula – it kept things nice and tidy. 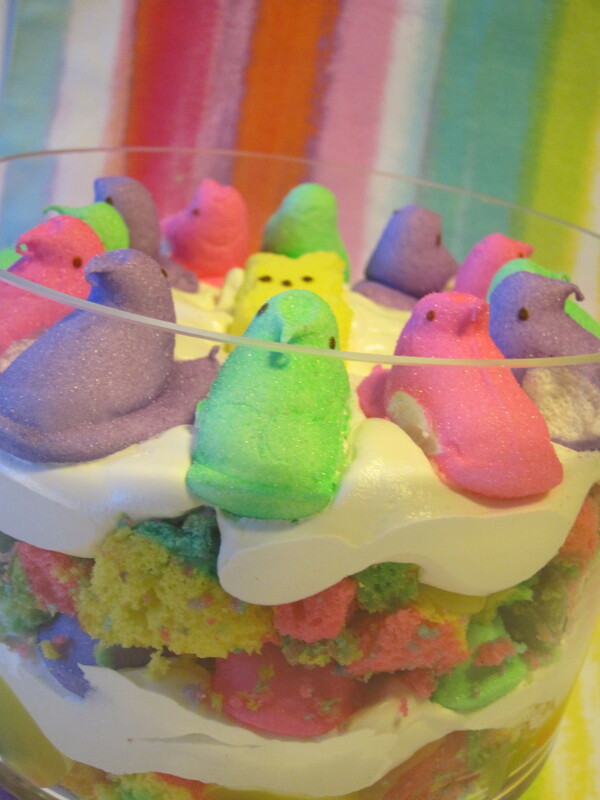 On top of the Cool Whip make a ring of Peeps, alternating colors as you go around. 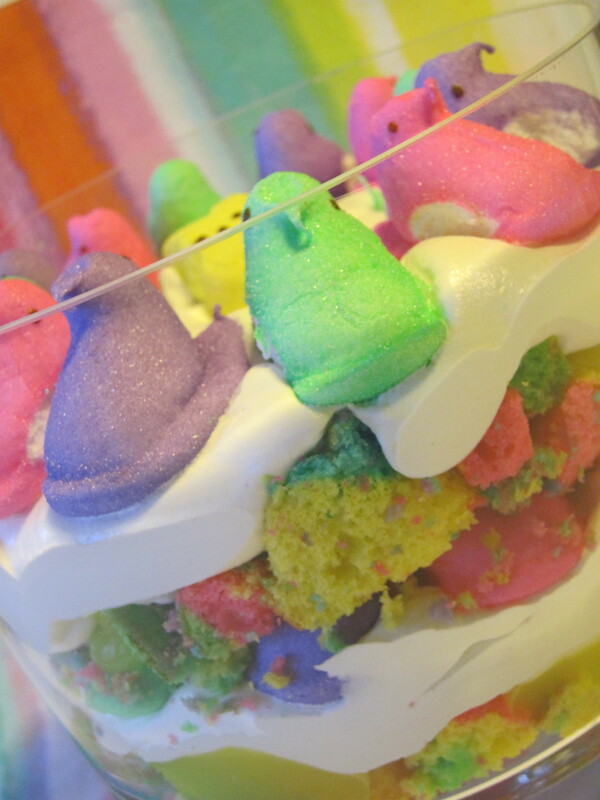 Once that it done, start your second layer in the same order, topping off the whole thing with another Peeps ring. And there you have it! 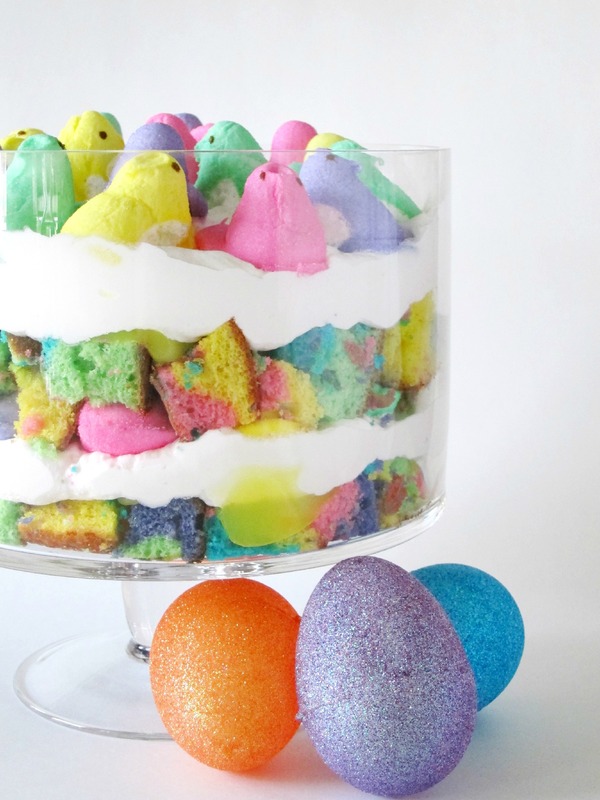 A bright, fun and refreshing dessert perfect for gracing your table at Easter dinner (and a great way for me to redeem some seriously deformed should-have-been-egg-shaped cupcakes).